The Fourth House is commonly referred to as the House of Home. When we think of home, we think of that place where we put down our roots. We lay our foundation and plant ourselves firmly into the Earth, as it were. One day, we will return to that very same Earth. The Fourth House brings things full circle by also addressing old age, endings and our final resting place. Much of the emphasis of the Fourth House, however, is on the concept of home. By laying down roots, we make a home for ourselves, or more specifically, the self. It’s worth noting that in addition to the external home (all the bricks and mortar around us), we have really brought the essential self home. "I’m home." The words themselves have a peaceful ring to them. The self is now centered, grounded, one and at peace with the Earth. We seek to come home both physically and psychically, for ourselves and for those we love. By creating home, we create a meeting place, a sanctuary, a sacred place for ourselves and for others. In our home, we integrate the self with all that has come before us and helped to shape what we are today. We create a domestic space which comforts and nurtures us and serves to keep safe those we love. Also important here are family history, cultural and societal norms, and ways of being. All of these are ruled by the Fourth House, as are our ancestry, roots and heritage. These qualities are brought "home" through us and integrated into the place we call home. Helping to create the home we make are our parents, for it is they who greatly nurture and shape our being. Therefore, the Fourth House can also be thought of as the House of the Mother, the Parent or the Nurturer. Looking at things from a strictly tangible point of view, we can see that the Fourth House also encompasses physical structures (houses) and real estate. The Fourth House represents family, history and traditions. All of these contribute to the process of becoming a true, actualized and individualized self. This is how we come home. This house is about how we react to, and reflect (Moon) what’s totally beyond our control. That’s our family of origin, and the cultural heritage we emerge from. It guides what we do with that heritage. Creativity in this house might inspire story or visual art that comes from that sense of personal roots. Sometimes it takes a lifetime to resolve those given family factors, with who we sense we really are as an entity apart. That’s why the fourth house is full of gifts and challenges that lead to the deepest kind of questioning and soul growth. 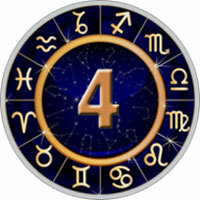 The Fourth House is ruled by Cancer and the planet Moon.